Highly Recommend written by mobile Received in good condition. New version of C7824WIP plus. Received in good condition. New version of C7824WIP plus. fast delivery and easy to install. Purchase few times from the same seller. Good product and service. Working well and clear image. But abit laggy. Fast delivery. I like it. App is user friendly. 3rd purchase fr same seller for same item. Can one camera be linked to multiple phones or can it be seen only in one phone? Can it be logged in from overseas as well? One camera can be viewed by four mobile phone owners in one time. Sure it can be logged in from overseas. Yes, you need to turn on when you doing live view. sound icon like a earpiece. Where can I insert the MicroSD Card and how can I use the continuous recording function? SD card slot at below the lens, you can double check. Inside the box have one paper showing to you. Can it be connected to v380 app? V380 is for safevue camera, vstarcam is using EYE4. 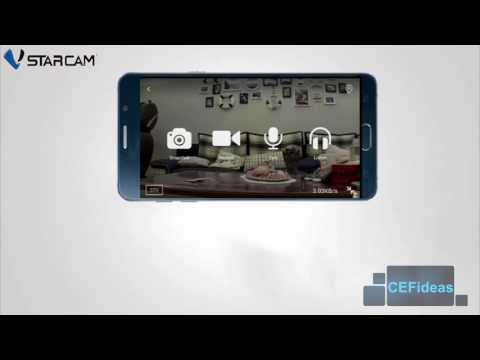 Is The white camera that can be controlled from eye4 app, like in the video, ready for order? Yes, may i know what is the model. Yes, you can order online or direct come to our store. Are you bringing in any 2018 models ? I cannot find them here. What model you want. model 2018 is 7824pro. Hi, I am looking for battery operated or USB chargeable CCTCVs (so that I do not need to keep the power cord in pall the time). Are your CCTVs like that? For Vstracam need AC power.